It's easy to get comfortable in our routines, but life is richer and more fun if you allow yourself to be challenged. Travel allows us to enjoy new experiences, meet interesting people, and learn about different cultures--even if that means taking chances once in a while. Have you taken a risk lately? Please share your experience--and happy travels. 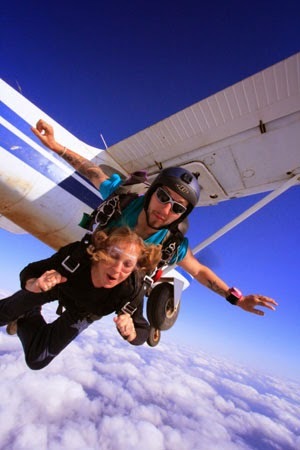 Photo of Beverly from Texas Skydiving Center.